My husband is in the Air Force, and we learned that his next assignment was Moody AFB. Neither of us had ever been to Valdosta, or any of the surrounding areas. When we made the trip here, we knew that we wanted to buy a home. After we found a home we were interested in, we called the realtor that was listed on the sign-- Sue Barnes, from The Herndon Company. Sue went out of her way to show us the home after-hours in order to fit our busy schedule. My husband and I decided that the first house was not for us, and Sue made it a point to compile a list of homes that would suit our wants and needs. Over the course of house-hunting together, we learned that Sue has spent much of her life in the area, and she is incredibly knowledgeable about the neighborhoods, schools, property taxes, etc. The process of buying our home was a breeze, and we have Sue Barnes and The Herndon Company to thank! Kriston D.
Larry Mercer with the Herndon company made the sell of my home a very positive experience. He was spot on with everything that he said and what to expect throughout the selling process. Very professional. Michael M.
Dorale Smith worked with my husband and I as we moved to Valdosta, Not only is she personable and extremely knowledgeable of the area she was beyond patient as we looked at close to 30 homes to find our home. Our move was not without a few stumbling blocks with the most notable being the condition the home was left in by the previous owners. Dorale acted on the spot to secure cleaners and painters who worked over a weekend so when the moving van showed up the house was in move in condition. We have and will continue to refer Dorale to anyone moving into or out of this area. Taking a vested interest in each client and being there after the sale are qualities not often found in sales positions. The integrity Dorale carries herself with is what sets her apart and makes her an invaluable asset to The Herndon Company. Chari N.
In selling my home, I found your realtor Suzanne Montgomery to be most helpful. Her knowledge of the area and her willingness to help me through a most difficult time in my life was beneficial to me in many ways: She presented comparable homes to me for review in not only searching for a new home but to price mine, she explained in depth the buying/selling process to me and she was always available to answer questions either in person, by phone or via text. Her expertise in the real estate market in our area is unsurpassed. 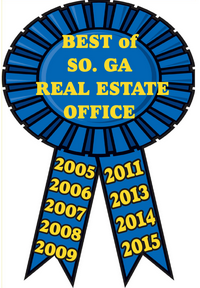 Annually, I vote for The Herndon Company as Best Real Estate agency. Thank you for representing Valdosta so well! Cheryl M.
Jerry Hughes w/ Herndon was an excellent agent for us. His knowledge of our home, neighborhood, and the current real estate climate was thorough and helped us tremendously in determining price, expectations, and with negotiations. He was always available, checked on our home frequently (while for sale and empty), and, best of all, got the house sold!. I highly recommend him and Herndon to handle the selling of your home. You can trust them. Micky G.
My husband was offered a position in Tifton, so we had to leave our beautiful Palm Harbor, FL home, where we were 2 miles from the Gulf! UGH. When we determined that he was happy here, Valdosta was the area we settled on. Suzanne Montgomery was recommended to me and without calling anyone else, we connected. Suzanne listened to our needs, both in style and budget. She was honest and not pushy, she understood (my) emotions of relocating from a place I loved. Suzanne is organized, and highly professional. I am also blessed to also call Suzanne my friend Susan M.
We recently purchased a home and Sue Barnes was our real estate agent. She was amazing! She walked us through the whole process and answered all of our questions! I would definately recommend her to anyone looking to purchase a home! We are so grateful for everything she had done for us! Cheryl P.
Dedra Hughes, realtor with The Herndon Company, was terrific. She gave me awesome ideas on how to stage my home to help sell it quickly. Her ideas neutralized and updated many aspects of my home to make it most appealing to potential buyers. She proposed ideas and specific directions on how to make those ideas happen. After we made the updates that Dedra suggested, she created a virtual tour which was beyond phenomenal. My home looked fabulous and I was thrilled with the updates. Dedra definitely has a knack for decorating, knows the most popular paint colors and has an extensive list of local connections to get punch list items performed very quickly. Together we were able to work together as a team to sell my home faster. Teresa F.
I highly recommend DoraLee. She is very knowledgeable and a real "go-getter". This was our first home we sold and we needed her guidance and expertise through the whole process. She is very attentive and made us feel we were her only clients. Juanita C.
We recently relocated to the Valdosta area and were referred to Dedra Hughes to help us find a home. I am so happy we had her to help us with the transition! We had a very short amount of time to find a home and a long list of very specific needs that had to be met. I don’t know how she did it; but, Dedra found the perfect place for us! Not only is she very professional and knowledgeable about real estate; but, also patient and kind (think all day in the car with a squirmy, whiny 4 year old). She was able to calm my fears and anxiety. Needless to say we were tough customers; but, Dedra went well above and beyond our expectations. I would highly recommend her! Sarah M.
My fiancé and I recently purchased a home through The Herndon Company with Sue Barnes. Sue was wonderful! I cannot imagine working with a better agent. She was patient and understanding of our wants and needs. Working with Sue truly made the whole experience fun, exciting, and stress-free. She found the perfect home for us and walked us through the entire process. Sue helped make the largest (and typically the most stressful) purchase of our lives an enjoyable experience from start to finish. We highly recommend Sue Barnes to anyone. Bart B.
Larry Mercer and The Herndon Company did a fantastic job in helping us find a home. Larry was extremely knowledgeable, responsive, and kind. He walked us through every step of the process. I trusted him completely. I would highly recommend Larry Mercer and The Herndon Company to anyone looking to buy or sell a home. Maria P.
Dedra Hughes sold our house for us within two days! I have known Dedra for many years and she is very skilled and competent. She is involved in community service and has a broad base of relationships within the area. I trust Dedra completely and have full confidence in her knowledge of the market and her ability to get the job done in a quick and professional manner. L.A.J. The Herndon company treated us very well. My dad recently passed away leaving my step mom and young siblings behind this is my step moms first time living in the states Stacy helped us find them the perfect house. She was very patient with us and showed us many houses and explained the entire home buying process. Communication was fast and professional, she answered all questions we had promptly and accurately. I would recommend Stacy to others looking to buy a home :) Virginia M.
Sue Barnes is an amazing real estate agent! She has assisted my family with buying and selling real estate since 1996, an amazing 19 years! Sue's professionalism, honesty, market knowledge, and due diligence shine through in her dealing with all her clients. She will give you an honest current industry assessment and hold your hand to the last dot on the forms. Herndon Realty and Sue have always been there for me! I highly recommend them for your real estate work. Barbara R.